This evening had the opportunity to see and listen to Shaykh Hisham Kabbani who came to an inter-faith gathering at the newly established Musallah Tauhid. We had beautiful participation from three Abrahamic faiths: Jews, Christians and Muslims who all participated in the remembrance (zikr) and praise of the Prophet (Salawat). Shaykh Hisham blessed Musallah Tauhid's journey and prayed that may it become an example for others to witness unity. Here are some quick snap shot from the program. From the top: Green Turban with Rose of a Naqshbandi Darvish, Shaykh Hisham speaking, greeting people from Jewish Community, Shaykh in contemplation, Musicians, organizers and guests and the last picture is taken while Shaykh listening to blogger Frieda of Inspire, Move and Touch. Among other things Shaykh Hisham spoke about need for all faiths to come together and lesson from history of Islam how even during the time of second caliph, 1400 years ago such spirit was very much present and alive and there were established and flourishing place of worship where Jewish, Christians and Muslims shared common ground. Musallah Tauhid's vision and establishment emulate exactly that where a church shares space along with its Christian faithfuls, people of Jewish and Muslim faiths as well. Shaykh Hisham reminded that every human being is a Divine representative (Khalifatullah) on earth and that is a reason enough to do everything with happiness and celebration. As anyone who become a representative of a president or consultant to a respected person or ambassador of a king - takes pride in his or her job, Shaykh Hisham asked, what could be more joyous and a reason to feel honored than to be an ambassador of God here on this earthly plane. Shaykh also spoke about problem with extremists in the name of religion as he is never afraid of talking about problem within Muslim community and current terrorism. On many occasions he is the most vocal to criticize problem within Muslim community and certain doctrines which produced untrue criticism from many, who unlike him prefer to hide problems under the carpet and play the blame game upon others. The problem of terrorism and extremism is within, not outside. The longer Muslims will delude themselves with excuses of outside, the longer it will take to come out of current state of chaos and all the challenges posed upon them. Indeed God doesn't change what is persisting on people, until these people change what they are doing, reminds the Quran as mention Shaykh Hisham in one of his interview. Just before leaving for the program today I was watching a youtube video of Shaykh Hisham which mentioned how Shaykh Hisham in 1999 warned US state department of terrorist threat from extremists. [>] You may watch the video here. January 7, 1999, almost 3 years before the terrorist attacks of September 11th, Shaykh Hisham Kabbani warned the US. State Department of threats to National Security due to impending attacks from extremists and was labeled as an alarmist and ignored!
. 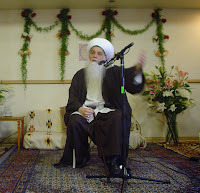 : You may watch more talks by Shaykh Hisham Kabbani from SufiLive website, the official media library of Naqshbandi-Haqqani Sufi Order of America.